Send wanted to send out a Happy Thanksgiving prayer to all of you and your loved ones. Here is my prayer for you. I love to have something small on my kitchen table for the holidays. After Halloween, I knew it would not be long before I put something for Christmas there so it had to be quick and easy. 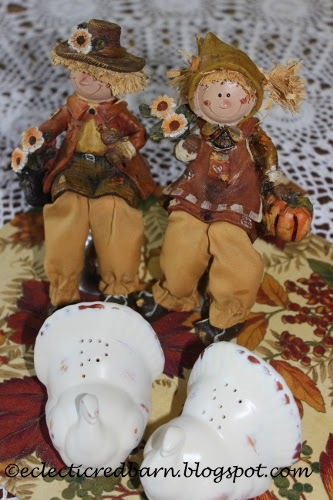 This little pumpkin base was perfect for my boy and girl scarecrows. As the holidays approach, we all spend a great deal of time preparing for them, including time performing cleaning chores. I pay particular attention to keeping my bathrooms clean since guests are always using them. I have put together 22 quick and easy tips to get and keep those bathrooms sparkling. Coming home from our house north of Orlando on Sunday, we stopped at a gas station to fill up and let the dogs out. 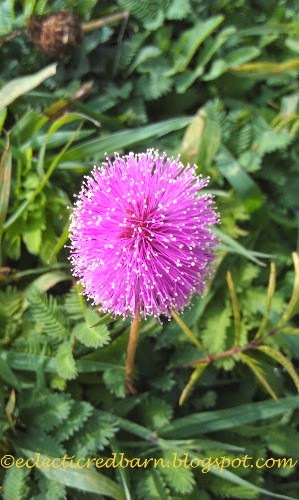 Near the gas station was a rather large area of grass and there were these lovely tiny pink flowers all over the ground. A couple of months ago, I saw three little bottles wrapped in wire to make a garland on Antique Farm House. Sorry I don't have a picture of the original one, but I liked it and wanted to recreate one for my deck. I think it was around $15. I wanted to make a dessert the other night and everything I wanted to make I didn't have this ingredient or that ingredient. So I reached for something with lemons since I had many of them. I found these Lemon Coconut Bars from Betty Crocker so that was going to be the dessert.